Hudson Shiraku works for Biovision’s Farmer Communication Programme (FCP) in Nairobi. As part of his job he keeps an eye on technological aspects of the programme activities. In our interview he explains the importance of the mobile phone in general and particularily M-Pesa, an SMS-based payment system with more than 17 million users in Kenya. Banks are seen by many as expensive to operate in terms of fees: They charge their customers for the storage and withdrawal services. Their services can only be accessed in major towns or even only in Nairobi. M-Pesa is cheap, convenient and you only need to go to one of these M-Pesa kiosks and agents. For many Kenyans it is uneconomical to save 500 shillings in a bank when the bank’s minimum balance is 200 shillings and it costs 50 shillings to withdraw it. A phone can cost from as little as 999 to over 50,000 shillings depending on the type of phone and the person who is buying it. So the affordability of phones and the fact that they all have the same M-Pesa features have contributed to the popularity of M-Pesa. 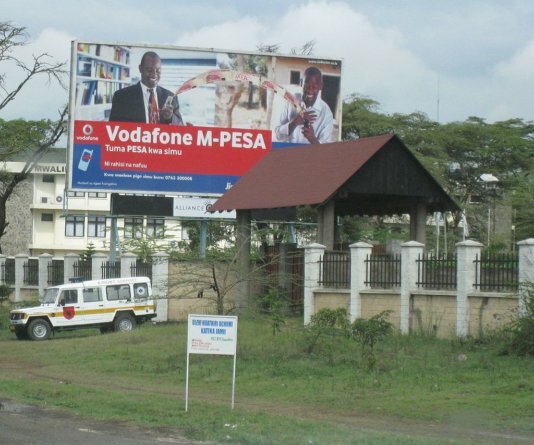 Do Kenyans think that it’s expensive or complicated to use a mobile phone? It is a yes and a no depending on the type of phone and the person who is using it. Some illiterate and old people who are not technologically savvy have just mustered the art of calling and receiving calls – the green and red buttons and they don’t bother about other applications. In this context, it’s not complicated but when they think of other applications it is. Expensive or not? It depends on the person who is buying it and the type of phone also. What might happen if more and more people have mobile phones with internet connection? I can do emailing and even search for information from the internet anytime and from anywhere. This is the kind of empowerment that people will get by this and I’m sure that they will accrue all benefits that come with it. It is usually said here that information is power.